Detailed survey of Regio VIII, activity included in the “Grande Progetto Pompei - Knowledge Plan, diagnostic services and monitoring the conservation status of Pompeii" – Lotto n.6, CUP : F69GI300150006, CIG : 5632076823. The detailed survey, realized with a 3D laser scanner based on phase variation, covered the whole area inside each insula and underground (.ca 60,000 square meters). The 2700 scans were aligned and oriented in the superintendence’s reference system. Survey by laser scanner and video inspection by UAV of the indoor of a large tank (20 meters height and 15 meters in diameter) used for storage hydrocarbons. The survey was conducted after a cleaning and remediation phase of the tank. By the use of a laser scanner it has been possible to carry out a three-dimensional reconstruction of the same tank from which obtaining the actual measurements. A specially equipped UAV with led headlights allowed the inspection in a confined environment with poor visibility conditions. The internal surface was illuminated by the UAV itself and therefore it was possible to verify the state of conservation of the whole surface of the tank. The drone was equipped with special devices and sensors adapted for taking water samples at different depths. This innovative technique allows monitoring of water quality, taking samples without disturbing the surface of the water body. An integrated GPS allows geo-referencing the samples. The concentration data may accordingly be processed in relation to the point of sampling, in order to create models of dispersion of pollutants in the aquifer. The three-dimensional modeling and rendering is an integral part of the survey and representation of the existing processes, as well as of the design process, tied both to architectural and industrial design scale. The different skills within the Errealcubo Studio let you cover all the circumstances, being able to provide digital products suitable for any kind of purpose. The test site consists of two vineyards in Vicobarone (PC) with a surface of about 1 ha each, with predominant east-west orientation land with a total height difference of about 20 mt. Various APR layout were tested with different types of electronic, as well as different flight altitude, inclination sensors and travel speed. As agronomic approach has made an analysis for the scientific validation of the data acquired by APR and comparison with current methodologies. The tests showed that with a flight time of only 4 minutes it was possible to obtain the sharp NDVI map of a vineyard of 1 ha. Survey of two fields one to lettuce and other corn. It was possible to quantify the production of salad and at the same time identifying areas in a state of suffering through the use of RGB and multispectral cameras and NDVI calculation. Errealcubo is actively participating in university research to develop multispectral detection techniques. Indeed, the development of new technologies is increasingly necessary in agriculture to increase productivity and to meet the new environmental needs. In particular are finding effective implementation in what today is called Precision Farming. By processing the acquired data from the APR you get the so-called "Prescription maps" geotagged that allow to know the right amount of fertilizers, herbicides and water at each homogeneous area of the field. It can, therefore, be developed appropriate selective strategies in a dose variable to optimize production and enhance the quality, saving resources. Due to the earthquake that took place in Ferrara during May and June 2012, numerous surveys have been carried out for the diagnosis of the structural conditions of the buildings. In particular the use APR for monitoring and inspecting damaged roofs proved to be very useful. 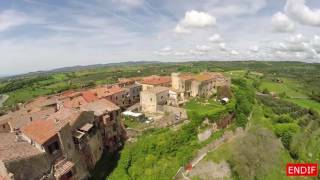 Three-dimensional survey by UAV and GPS of an area located near the town of Sant'Agostino (Fe) was carried out after the earthquake of 2012. The object of the survey area had been classified as "red zone" and therefore forbidden to unauthorized people. The photogrammetric acquisition was made through a DJI S800 UAV equipped with Canon EOS M mirrorless camera. Flying at an altitude of 120 m, approximately 700 frames were acquired and subsequently processed with the software Agisoft PhotoScan. The model was imported into CAD environment in order to produce an appropriate vector mapping. Survey of Fatima’s Church, located at Boavista, Cape Verde, for intervention and restoration project. The meteorological conditions of the site required special attention to working procedures: the island is characterized by a strong steady wind of 15-20 knots, anomalies in the magnetic declination and fine sand dispersed in salty air. A three-dimensional model of the church and of the surrounding soil, sections and a map with contour lines was made, in order to provide all the morphological information about the area. Three-dimensional reconstruction of the ex key factory located at Chaves in Boavista, Cape Verde. The photogrammetric acquisition was made through a Phantom 2 UAV equipped with GoPro Hero 3 Black Plus. Photographic survey of the supermarket, located in the province of Venice. Moreover, a short video for advertising and promotional purposes was carried out. The survey was executed in Pian di Venola near the town of Marzabotto (Bo), on the Reno River. Two UAV flights were performed at 100 meters of altitude acquiring 275 frames. Survey and three-dimensional reconstruction of the urban area where a new road junction will be realized. Starting from the 3D model obtained through APR photogrammetry, all the information necessary to the design of the road (longitudinal and cross sections, relative distances, etc.) have been extracted. The acquisition through 3D survey methodology obtains huge amounts of geometric data, from which particular analyzes can be carried out, such as analysis of the deformation or misalignment of an object. Such analyzes can highlight the differences between the various parts, locating anomalies and shape variations. In the nautical field, as in the two reported examples, this analysis is very important both for identifying sudden geometric variations, asymmetries and portions out from the manufacturing or legal tolerances, directly related to the behavior of the boat in water. The reverse modeling process can be applied to define a digital mold of a real object, on which carrying out geometrical analyzes as well as its 3D printing. In some cases, the obtained polygon model can serve as basis for the construction of mathematical surfaces and the creation of 3D models for project purposes. This happens when the product has no followed a digital process track or if physical modification to the existing physical model are necessary in order to put the object back into production. In both cases it is necessary to complete an highly accurate polygonal model through precise 3D acquisition tools, then to extract the basic geometric information from which produce the complete mathematical model, consisting of primary and secondary surfaces. In the presented cases (cases Limar and sugar bowl Alessi) the process from the survey to the construction of the mathematical model required a millimeter or sub-millimeter tolerance in comparison with the original object. The project required the integration of different survey systems for the acquisition and creation of a 3D model. In particular, 3D laser scanners triangulation-based and time of flight based have been merged, ensuring overall accuracy within the instrumental TOF error and a sub-millimeter detail precision given by the triangulation-based laser scanner. The polygonal 3D model has been then created and reconstructed by mathematical surfaces. These surfaces were compared with the geometric frame used as legal reference in Olympic competitions, in order to check the global distances and locate the surface points outside the tolerance. Finally the mathematical model has been printed with materials invariant to thermal expansion, creating an infinitely replicable model. Participation in different national research projects allowed to acquire considerable experience in the reverse modeling process of industrial product, defined as the methodology of surveying, modelling and transforming an existing object in a digital mold. The complexity level of industrial products depends as to the geometrical characteristics, the surface finishes (from maquette to finished products) and the global size (from small objects until big ones, even boats). The 3D survey requires necessary the ability to read the characteristics of the object, in relation to the purposes of the reverse process purpose, adapting the methodology of acquisition and 3D modeling. Aerial photogrammetric survey by UAV of a landfill, located in the province of Ferrara, in order to obtain orthophoto and sections as well as to estimate the volume of the detected area. With only one UAV flight, at an altitude of 40 meters, about 85 images were acquired to obtain the three-dimensional model and the orthophoto of the landfill. For scaling and geotagging the model, 13 control points, materialized by special panels appropriately positioned on the landfill surface, have been detected with a GPS NRTK. Significant sections of the study area were then extracted from the model in order to represent some profiles of the landfill. The calculation of the volume has been gained by additional post processing steps and the obtained value represents a very important for the future planning analysis of the site work. Survey and monitoring of a building in the hinterland of Mantova damaged by the earthquake of May 2012. The building roof shows considerable breakages. Cracks and damages have been detected only from the outside, as it was not safe to enter inside the building. Through the three-dimensional reconstruction it was possible to make different metrological analysis, including the evaluation of the overhangs of the wall and the quantification of damage. The building under monitoring is located in the northern part of the historical center of Ferrara, in a convent. Three monitoring lines have been materialized. A manual deformometer, that evaluates the amplitude variations of the lesions with a precision of one thousandth of a millimeter, has been used. The monitoring consisted in periodic height survey of bench marks by means of high precision digital leveling and in the determination of the corresponding height changes over time. In the present case, a levelling network of 13 control points has been materialized. The bench marks were made of stainless steel cylindrical bars firmly stuck in the masonry of the building at about 30 cm from the ground. For controlling the foundation settlements of a building in Bologna, a high-precision digital leveling was used. In particular has been realized a leveling line made of 6 control points, materialized by benchmarks placed in the building itself and in the adjacent one. The leveling line is connected to two benchmarks, belonging to the Subsidence control network of the City of Bologna. For the measurements it was used a high-precision digital level and an Invar coded rod. UAV survey of a landslide at San Marino (Italy). Development of a 3D model with texture, sections and orthophotos. Aero photogrammetric survey and production of orthophoto maps with contour lines of the landslide located at Valmara Venola Pian, Marzabotto (Bologna). A Renaissance building near the town of Ferrara has been the subject of several metrological tests carried out in order to verify the accuracy and reliability of some modern techniques of digital photogrammetry by drone. The aim was also to develop a procedure to obtain the best results in terms of accuracy, optimizing the acquisition times and image processing. The research involved the comparison between 3D digital models of the monumental complex obtained by photogrammetry and a reference model of the same object obtained by 3D laser scanning. By varying the conditions of acquisition (flight altitude, overlapping, camera settings), the distance from the object, the camera tilt axis (nadir and tilted axis), the number and location of the control points, different models have been obtained. Each model has been compared with the reference one, determining global average deviation and the maximum local deviations for some sections and architectural details. The results show good consistency between the different models obtained with different techniques. The city center of Magliano in Tuscany is characterized by medieval walls with lesions and sagging. A first UAV photogrammetric survey was carried out in order to implement a monitoring project of the walls. In this case a UAV was used to detect the damages of the external part of Galliera’s church, with particular reference to video inspection of the roofing and of the upper part of the masonry. Topographic and UAV photogrammetric survey of the tower for the evaluation of the damage caused by the earthquake in May 2012, and relative representation. Starting from the photogrammetric survey it was possible to reconstruct the crack pattern of masonry, quantifying the extent of the damage and determine the interventions to carry on for the building safety. Survey of St. Maurelio’s church in Ferrara. Data acquisition was performed with laser scanners and photogrammetry. After the seismic events occurred in Ferrara in May and June 2012, the church is currently under a project of restoration. Internal and external integrated survey of the entire abbey complex. The external walls have been surveyed by integrating point clouds recorded with a 3D TOF scanner, images by a photogrammetric campaign from the ground, while the roofs were acquired by a UAV platform. The interior of the building has been detected with a 3D phase shift laser scanner. The use of different technologies, based on active and passive sensors, has allowed a series of evaluations about the quality and reliability of the acquired data and, at the same time, it was possible to obtain dense point clouds, from which detailed information related to geometry and structural deformations were extracted. Photogrammetric survey of the Cathedral’s facade, consisting of a geometrically complex surface of 40 x 35 meters. The digital images acquisition of the entire facade was carried out by several UAV flights, with the camera optical axis perpendicular and tilted respect to the facade, framed in a topographic reference system. From the 3D model, obtained through image orientation and “Structure from Motion” processing, a high-resolution ortho-image was created and used as reference for the representation step in the scale of 1:50 to 1:20. Reality-based survey of the underground crypt and of the apse through the integration of TOF laser scanner and triangulation-based ones for surveying the sculptural details. The relief served for extracting geometric information, which have been integrated with historical analysis on the building evolution and on the stylistic features of different periods, up to the three-dimensional reconstruction of four different versions of the Basilica related to VI, XII, XV and XVIII century. The aim of the final digital products was to communicate and promote digital tools devoted to Cultural Heritage, framed in the network of the Roman CH in Milan.